Contemporary Aboriginal art in Canada owes an enormous debt to the many Saskatchewan artists who have enriched it with their vast array of artistic expressions. Beginning with the work of ALLEN SAPP, a number of Aboriginal artists working in two- and three-dimensional media, installation, and performance art have created significant works of art that comment on issues related to Aboriginal people in Saskatchewan, such as politics, social concerns, and spiritual matters. These artists utilize a wide variety of artistic styles ranging from realism to abstraction. Many contemporary Aboriginal artists integrate art forms from more than one artistic medium, or collaborate with writers and dancers in their artistic endeavours. Moreover, contemporary Aboriginal artists often incorporate traditional Indigenous cultural expressions with established Western mediums and new technologies when creating their works. Through their explorations, these artists and their work become part of the process of debate and critique in questioning the boundaries constructed within the art establishment. Allen Sapp, a Plains Cree artist from the Red Pheasant Reserve uses a realist style to depict life during the reservation period of his youth. Since the 1960s his painting has been internationally recognized and heralded as an important contribution to Saskatchewan contemporary art. His narrative manner has influenced other Saskatchewan artists such as Sanford Fisher, Henry Beaudry, and Michael Lonechild. In 1987, Allen Sapp was awarded the Order of Canada. Bob Boyer was a Métis artist whose politically charged Blanket series launched his career: he used blankets and Plains Indian designs together to comment on colonialism. Boyer was part of a newer generation of Saskatchewan artists educated in art schools, but with a knowledge of traditional Aboriginal art. His work is shown both nationally and internationally. In addition to painting, Boyer curated a number of important art exhibitions, including a retrospective of Allen Sapp’s work. 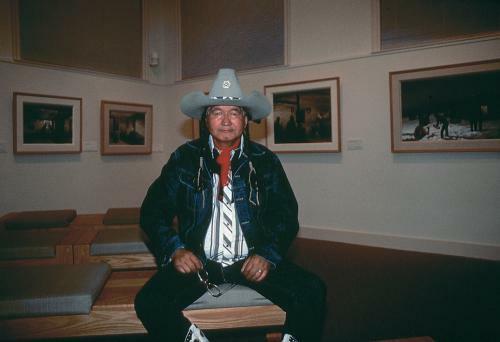 Boyer taught art and art history in the Indian Fine Arts department at the Saskatchewan Indian Federated College (now First Nations University of Canada) from 1980 until his death in 2004. Gerald McMaster, from Red Pheasant First Nation, has worked in a variety of media to comment on issues of colonialism. In 1981 McMaster was appointed Curator of Contemporary Indian Art and subsequently became Curator-in-Charge of the First Peoples Hall at the Canadian Museum of Civilization. In this capacity, he has created a number of significant exhibitions of contemporary Aboriginal art in Canada. McMaster has shown his two- and three-dimensional art nationally and internationally. Edward Poitras, a Métis Treaty Indian from Gordon’s First Nation, creates installation environments through his art. Poitras was the first Aboriginal artist to represent Canada in the Venice Biennale of 1995. He benefited from the guidance of Sarain Stump at the Saskatchewan Indian Cultural College’s Indian Art program, along with other Saskatchewan artists such as Ray McCallum. Drawing on both urban and reserve living experiences, Poitras often implies ideological conflicts through juxtapositions in his mixed-media sculptures and installations. Jerry Whitehead, from the James Smith First Nation, paints abstractly, combining traditional forms such as powwow dancing in his art. Neal McLeod, also from James Smith First Nation, creates bold abstract expressions that incorporate traditional stories and contemporary issues, in addition to creating films and poetry. Mary Longman, born in Fort Qu’Appelle, offers a rich story of family, loss, and rediscovery in her sculptural art. In her video and performance art, Dana Claxton, born in Yorkton, also explores issues of identity. Sheila Orr mixes traditional media such as porcupine quills and beadwork with acrylics and canvas; she teaches traditional arts at First Nations University of Canada. Sherry Farrell Racette’s work explores Métis history, cultural traditions and women’s issues in her multimedia creations, which often include a variety of technologies such as beading and quilting. Just as these noted contemporary Aboriginal artists have individually contributed to the history of contemporary Aboriginal art in Canada, countless others continue to be inspired and motivated to further this visual dialogue. The Fine Arts department at First Nations University of Canada provides an excellent opportunity for studying both contemporary and traditional art forms. These emerging artists are making strong connections to both the past and the future of Aboriginal art in the province. Acland, J.R. 2001. First Nations Artists in Canada: A Biographical/Bibliographical Guide, 1960–1999. Montreal: Concordia University Press; McMaster, G. 1988. “Saskatchewan Indian Art: More than Beads and Feathers,” Saskatchewan Indian (July/August 1988): 13–14.